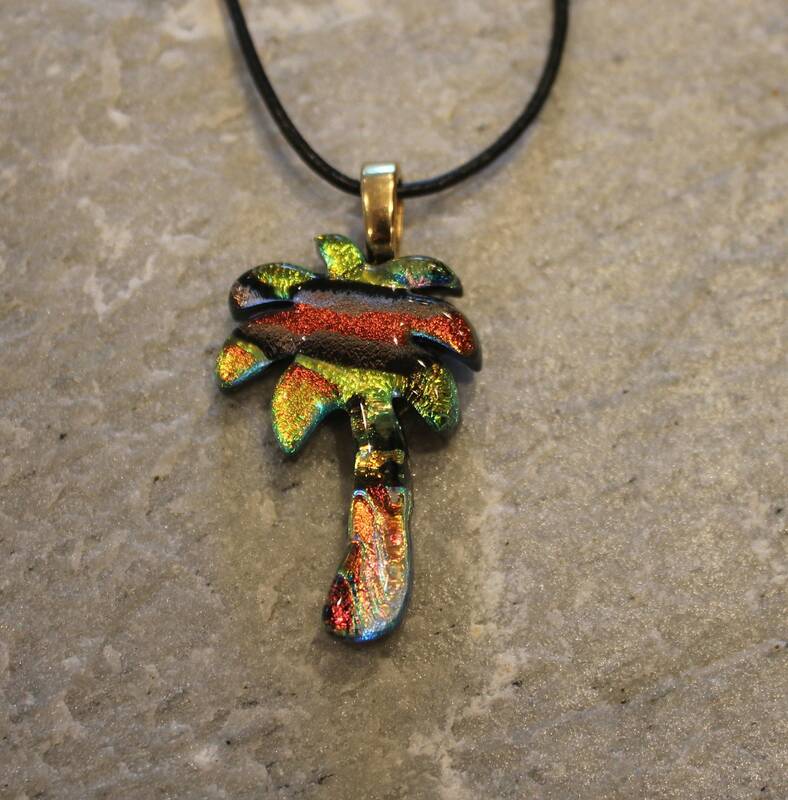 This Dichroic Fused Glass Tropical Palm Tree Pendant is a one of a kind work of wearable art. I used only the highest quality materials and made this piece in my art studio in California. I fused multiple layers of glass together in my kiln. Then with great care and artistry, I used a laser saw to cut out this Palm Tree shape and rounded the edges before re-fusing the piece in the kiln to give it a fine polished appearance. This piece was properly annealed for strength and durability. The Dichroic pendant exhibits a vast array of color depending on the angel you view it in. The depth and variance of color and patterns are especially visible when light shines on the piece. The Palm Tree has vibrant oranges and greens to name a couple. This pendant is on a gold plated bail and is 1" by 1 1/2 ". It comes with an 18" expandable to 20" black leather necklace. It also come is a lovely organza gift bag.